Opencart Marketplace Delivery Restriction: Using this module, the admin and the sellers can restrict customers to add products to cart based on location. The admin or a seller can set shipping zone according to a country, zone, and zip code range. Delivery restriction data can be also be uploaded via. CSV, XLS, or XML files. Opencart Marketplace Delivery Restriction: With this module, admin/seller can restrict the customer to add the product to the cart based on the shipping address on which the product is needed to be delivered or shipped. The customer is restricted based on the parameters like country, zone, and zip code range. The sellers and the store owner both can add the shipping address for which the respective seller’s product will be available to add to cart. This module is an add-on of Opencart Marketplace Module. To use this module, you must have installed the Opencart Marketplace Module first. The Module offers easy shipping management on the Marketplace Website. The admin/sellers can add the shipping zones for which the product will be added to cart. Multiple shipping zones can be added in CSV, XML, and XLS format. If the shipping address is not validated then the customer will be displayed the error message. Why do you need this module for your Marketplace website? In a marketplace website where multiple sellers are added. Each seller having a designated area of delivery it often becomes hard for the admin/store owner to manage these shipping. But with the help of this module, the admin/store owner does not have to pay much heed to the shipping management. The seller on its own can add the zones for which the delivery will be available for their respective products. Integrating Restrictions On Product After the module is installed, the admin can be used to configure the module as per its need. After the module is installed, the admin can be used to configure the module as per its need. The admin can enable or disable the module as required. The custom message can be added or edited by the admin when the shipping address does not lie under the respective shipping zones. The admin can add his shipping zones for which the customer can add the products in add to cart. Either existing or new shipping zones can be added. The admin/seller can add the shipping zones which will be added for their respective products. The seller can add his zones for validations. The seller can add the shipping zone one by one or multiple in a single go. The seller can mass upload the shipping zones through CSV, XML, and XLS. The seller can enter the country for which the zone is created. The seller can enter state under the following country for which the zone is created. The seller can enter the zip code range for which the zone is validated. The admin/seller can mass upload the shipping zones as well. This will allow the admin/seller to add multiple shipping zones in a single go. The admin/seller can add the shipping zones through CSV format. The admin/seller can add the shipping zone through XML format. The admin/seller can add the shipping zone through XLS format. The customer will be able to check the following validation of the customer product by adding the product to cart. If the customer’s shipping address lies under the shipping zone, then the product will be added to cart. The custom message will be displayed if the customer’s shipping address does not lie under the shipping zone. If the customer’s default address is under the shipping zone but changes the shipping during the checkout then in that scenario also the customer will not be able to make the checkout. Set a custom message to display on the storefront. Restrict customer to add products to cart. The admin can set shipping data according to country, state/zone, and zip code range. A seller can set shipping data according to – country, state/zone, and zip code range. The admin can check shipping restriction data of sellers. Import shipping data via CSV, XLS, or XML also available. Did you buy OpenCart Marketplace Delivery Restriction? Can the seller add the shipping zones for validation? Yes, the seller can add shipping zones for the validation. What if the customer changes the shipping address after Add to Cart? If the customer changes the shipping address on the checkout page then the customer will not be able to proceed further. Can each seller add his unique shipping zones? Yes, each seller can add his unique shipping zones. What if the customer makes a Guest Checkout purchase? 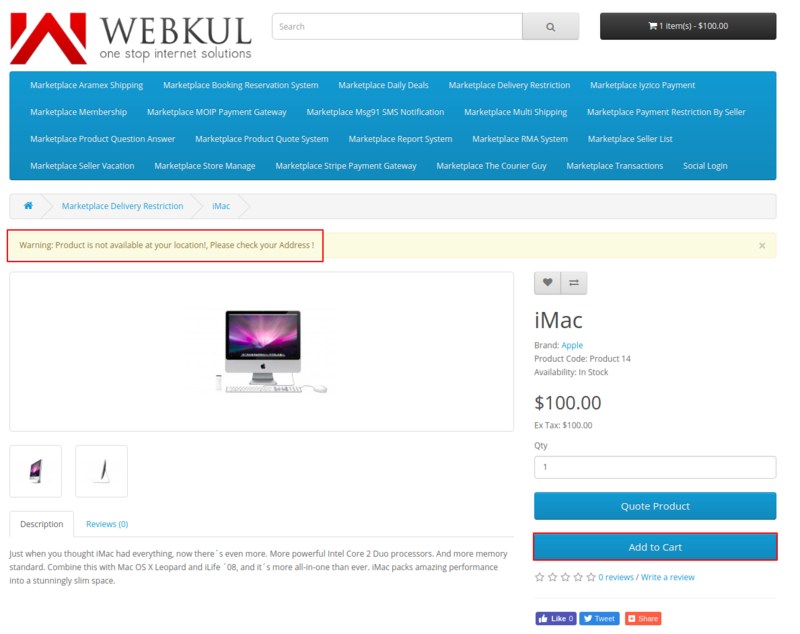 The customer can add the product to cart but during the checkout, if the shipping address is not validated then the error message will be displayed. How can seller restrict shipping for Opencart Marketplace Website? The seller can restrict shipping for Marketplace Website by using Opencart Marketplace Delivery Restriction Module.